Vignoles is a fruity semi-dry wine, a good companion to summer seafood dishes. 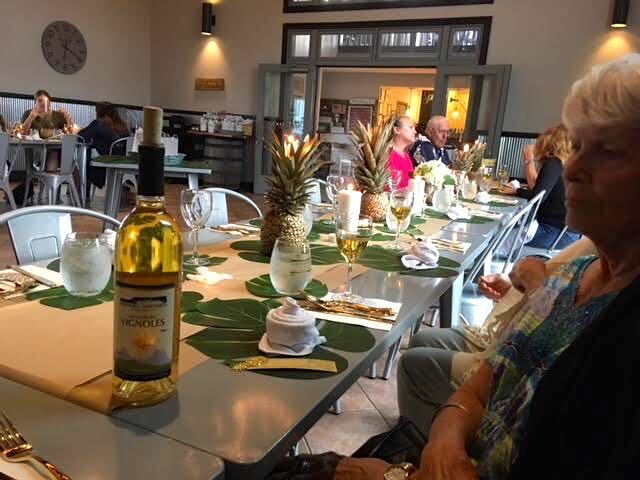 What a delicious way to learn about local wines and what dishes to pair with them. This is my second special monthly meal during 2018 at Meramec Vineyards in St. James, Missouri. 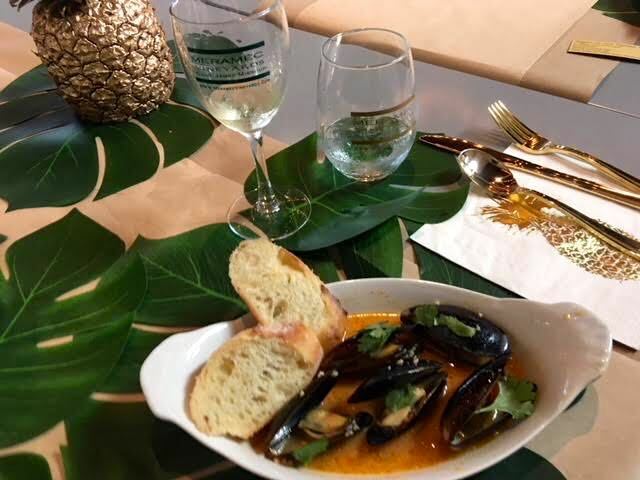 The business was recently purchased by a young couple who are putting a new spin into the local favorite winery by hosting monthly special dinners paired with one of their wines. According to Brian Boulware, they spent this summer perfecting their white wines, including the Vignoles. This dinner was in August, the height of a hot and humid Missouri summer. 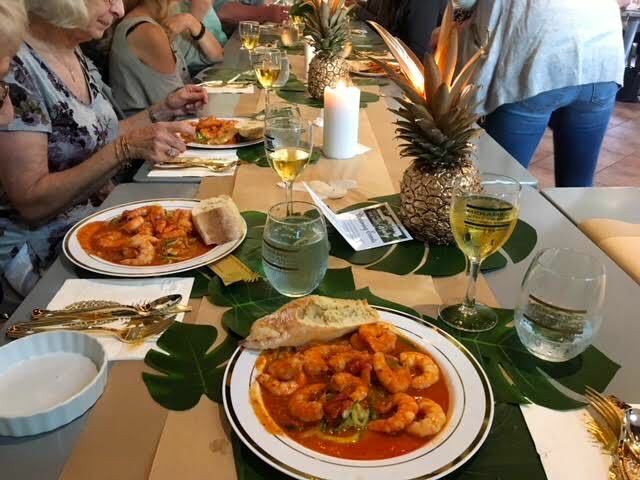 The decor was tropical with gilded pineapples and palm trees, a nod to our hot tropical weather and the fruity flavors in the wine. To kick off the evening, we had steamed muscles in a scrumptious tomato and garlic sauce. My friends and I asked for extra bread so we could enjoy more of that delicious sauce. As one of my dining companions said, there is no such thing as too much garlic. The first course was steamed muscles in a scrumptious tomato and garlic sauce. 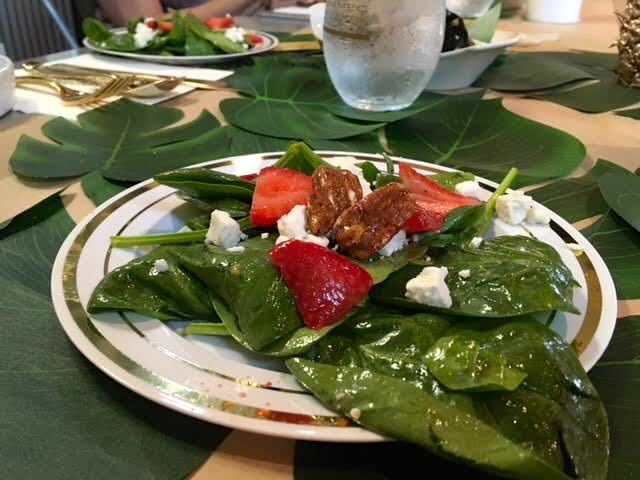 The second course was a refreshing spinach and strawberry salad topped by caramelized pecans. By this point we were all speculating about what was in the water. There was a distinctive extra taste but not one of us could put a name to the special flavor. Caramelized pecans topped the spinach and strawberry salad, so light and refreshing. For the main course, spicy shrimp in a tomato sauce over zucchini noodles. I love shrimp but this dish was a little too spicy for my taste. I took half of it home and had it for lunch the next day. By then the spices had settled down and it was just right. A most generous plate of spicy shrimp on zuchini noodles, enough for a second day lunch meal. For desert, one of my all-time favorites, crème brûlée with a lovely strawberry carved as a flower and other edible flowers as garnish. Having tried crème brûlée at various locations around the country, this is a tough desert to get all of the elements right. The custard is usually either too heavy or the caramelized sugar is too thick. France, England, and Spain all claim to be the country where crème brûlée had its origin. The first printed recipe for a dessert called crème brûlée is from the 1691 edition of the French cookbook Le Cuisinier Royal et Bourgeois by Francois Massialot, a cook at the Palace of Versailles. In England, this desert is called "burnt cream." I vaguely remember a similar dish from Brazil. Whatever one calls it, this version was just right! A lovely strawberry carved into a rose shape on top of the lightest creme brulee. I have to confess, I have tried a couple of times since this dinner to carve strawberries into roses. Luckily I eat the samples along the way and there is going to have to be a lot more practice before I have anything to show for it! And what was in the water? It was lemon lime, cucumber and basil giving the ice water a delicious summer note. Reminded me of the spearmint water I like to make in summer. I bought a bottle of Meramec Vineyards Vignoles to enjoy at home. I will get it quite cold before pouring a glass when I make a salad out of my own garden. It will be a few weeks before I plan this meal but I am already looking forward to it! Lettuce butterflies are a great fun, and easy, treat. Using Romaine lettuce, cut 3 to 4 inch pieces, then trim wings. 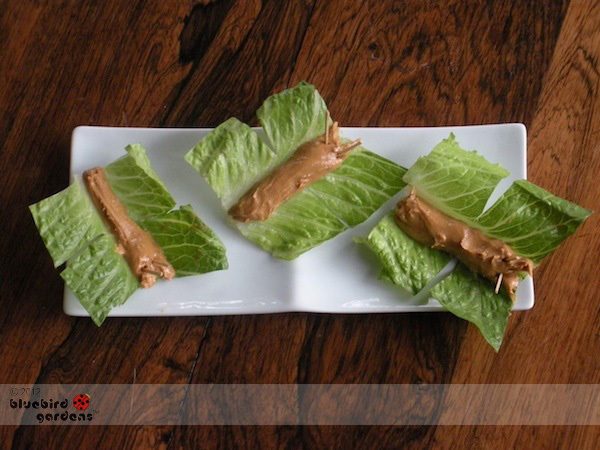 Add reduced fat peanut butter, almond butter or a favorite butter spread; spoon 1/2 tsp and roll in your hand. Place in lettuce center; shape the head at the end with toothpick. Break toothpick in half; add to head so the butterfly can easily be picked up with fingers.